Paintings! Both big and small. This is a work I did for the side of a house. It's 7' by 11', acrylic on plywood. This painting was for a door on the outside of a house. The source image was a picture I took. It's about 3' by 6.5', acrylic on wood. This is a detail of the above painting. A watercolour painting of the Chrch of St. Andrew and St. Paul. 8" by 13". A watercolor I did of my dog Noosa. 14" by 8". This is my Norman Rockwell inspired portrait of a friend and his dog who passed away. 10" by 12", watercolour on paper. Martinique beach. Small acrylic on canvass. 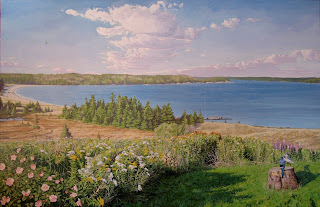 Taylorhead Beach. 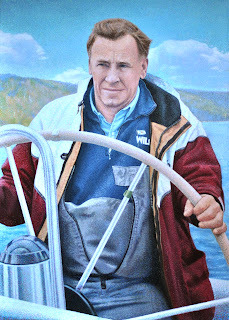 Small, acrylic on canvass. 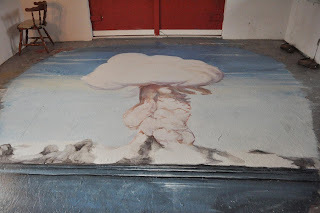 Mushroom cloud I painted on my studio floor. Kaaabooooom! I took a picture of it before it gets ruined by wet shoes and dog paws. A projected Matte painting I've been working on.